Carter J 2012. 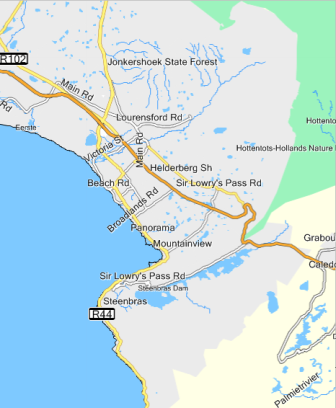 Somerset West - SABAP1 and SABAP2 compared. Ornithological Observations 3: 253-267. This paper compares atlas survey data for 2 time periods around Somerset West, South Africa. SABAP1 ran from January 1987 to 1991, covered a quarter degree grid cell QDGC (15' latitude by 15' longtitude), and checklists covered up to a month. The current SABAP2 project started on 1 July 2007, cover a pentad grid (5' latitude by 5' longitude), and surveys take place between 2 hours and 5 days. In this paper the data of the 9 pentads of SABAP2 were collated to compare it to the QDGC data (3418BB) of SABAP1 - the map (left) shows the area covered. The author describes the area and lists the pentads. He notes that the area around Somerset West has been developed extensively over the 20 years since SABAP1 ended. During SABAP1 a total of 736 cards and 260 species were recorded in the QDGC. During SABAP2 a total of 468 cards and 246 species were recorded in the QDGC by 24 September 2012. The author discusses the birds showing the largest changes, and provides possible reasons. Appendix A contains a full list of all the species recorded in both SABAP1 and SABAP2. The species are ranked by change in reporting rate â€“ with 104 species showing increased reporting rates and 124 displaying a decrease in reporting rate. Three weavers show slight declines but these may not be significant: Cape Weaver (-8.8), Yellow Bishop (-7.0), and Southern Red Bishop (-10.2). The Southern Masked Weaver showed a large increase (40.7) and the author attributes this to the concentration of atlasers on known wetland areas within pentads to swell the species numbers. The Red-billed Quelea is not listed as it was not recorded during the two atlas periods, but has been recorded at nearby Rooi-Els (see here).